The New York Giants are a professional American football team based in the New York metropolitan area. The Giants compete in the National Football League (NFL) as a member club of the league's National Football Conference (NFC) East division. The team plays its home games at MetLife Stadium in East Rutherford, New Jersey, which it shares with the New York Jets in a unique arrangement. The Giants hold their summer training camp at the Quest Diagnostics Training Center at the Meadowlands Sports Complex. The Giants were one of five teams that joined the NFL in 1925, and is the only one of that group still existing, as well as the league's longest-established team in the Northeastern United States. The team ranks third among all NFL franchises with eight NFL championship titles: four in the pre–Super Bowl era (1927, 1934, 1938, 1956) and four since the advent of the Super Bowl (XXI (1986), XXV (1990), XLII (2007), and XLVI (2011)), along with more championship appearances than any other team, with 19 overall appearances. Their championship tally is surpassed only by the Green Bay Packers (13) and Chicago Bears (9). Throughout their history, the Giants have featured 28 Hall of Fame players, including NFL Most Valuable Player (MVP) award winners Mel Hein, Frank Gifford, Y. A. Tittle, and Lawrence Taylor. To distinguish themselves from the professional baseball team of the same name, the football team was incorporated as the "New York National League Football Company, Inc." in 1929 and changed to "New York Football Giants, Inc." in 1937. While the baseball team moved to San Francisco after the 1957 season, the football team continues to use "New York Football Giants, Inc." as its legal corporate name, and is often referred to by fans and sportscasters as the "New York Football Giants". The team has also acquired several nicknames, including "Big Blue", the "G-Men", and the "Jints", an intentionally mangled contraction seen frequently in the New York Post and New York Daily News, originating from the baseball team when they were based in New York. Additionally, the team as a whole is occasionally referred to as the "Big Blue Wrecking Crew", even though this moniker primarily and originally refers to the Giants defensive unit during the 80s and early 90s (and before that to the Los Angeles Dodgers baseball teams of the late 1970s and early 1980s). The Giants played their first game as an away game against All New Britain in New Britain, Connecticut, on October 4, 1925. They defeated New Britain 26–0 in front of a crowd of 10,000. The Giants were successful in their first season, finishing with an 8–4 record. In 1930, there were still many who questioned the quality of the professional game, claiming the college "amateurs" played with more intensity than professionals. In December 1930, the Giants played a team of Notre Dame All Stars at the Polo Grounds to raise money for the unemployed of New York City. It was also an opportunity to establish the skill and prestige of the pro game. Knute Rockne reassembled his Four Horsemen along with the stars of his 1924 Championship squad and told them to score early, then defend. Rockne, like much of the public, thought little of pro football and expected an easy win. But from the beginning it was a one-way contest, with Friedman running for two Giant touchdowns and Hap Moran passing for another. Notre Dame failed to score. When it was all over, Coach Rockne told his team, "That was the greatest football machine I ever saw. I am glad none of you got hurt." The game raised $100,000 for the homeless, and is often credited with establishing the legitimacy of the professional game for those who were critical. It also was the last game the legendary Rockne ever coached; he was killed in an airplane crash on March 31, 1931. In a 14-year span from 1933 to 1947, the Giants qualified to play in the NFL championship game 8 times, winning twice. During this period the Giants were led by Hall of Fame coach Steve Owen, and Hall of Fame players Mel Hein, Red Badgro and Tuffy Leemans. The period also featured the 1944 Giants, which are ranked as the #1 defensive team in NFL history, "...a truly awesome unit". They gave up only 7.5 points per game (a record that still stands) and shut out five of their 10 opponents, though they lost 14-7 to the Green Bay Packers in the 1944 NFL Championship Game. The famous "Sneakers Game" was played in this era where the Giants defeated the Chicago Bears on an icy field in the 1934 NFL Championship Game, while wearing sneakers for better traction. The Giants played the Detroit Lions to a scoreless tie on November 7, 1943. To this day, no NFL game played since then has ended in a scoreless tie. The Giants were particularly successful from the latter half of the 1930s until the United States entry into World War II. They added their third NFL championship in 1938 with a 23–17 win over the Green Bay Packers. They did not win another league title until 1956, the first year the team began playing at Yankee Stadium in the Bronx borough of New York City. Aided by a number of future Pro Football Hall of Fame players such as running back Frank Gifford, linebacker Sam Huff, and offensive tackle Roosevelt Brown, as well as all-pro running back Alex Webster. The Giants' 1956 championship team not only included players who would eventually find their way to the Pro Football Hall of Fame, but a Hall of Fame coaching staff, as well. Head coach Jim Lee Howell's staff had Vince Lombardi coaching the offense and Tom Landry coaching the defense. From 1958 to 1963, the Giants played in the NFL Championship Game five times, but failed to win. Most significantly, the Giants played the Colts in the 1958 NFL Championship Game, which is considered a watershed event in the history of the NFL. The game, which the Giants lost in overtime 23–17, is often called "The Greatest Game Ever Played" and is considered one of the most important events in furthering the NFL's popularity. The following year, they lost the championship to the Colts again, giving up a 9-7 4th quarter lead en route to a 31–16 loss. Both the 1961 and 1962 championship game matched the Giants up against the Green Bay Packers, with the Giants losing both 37-0 and 16-7 respectively. In 1963, led by league MVP quarterback Y. A. Tittle, who threw a then-NFL record 36 touchdown passes, the Giants advanced to the NFL Championship Game, where they lost to the Bears 14–10 for their third consecutive championship loss, as well as their fifth loss in the title game in 6 years. From 1964 to 1978, the Giants registered only two winning seasons and no playoff appearances. With players, such as Tittle and Gifford approaching their mid 30s, the team declined rapidly, finishing 2–10–2 in 1964. They rebounded with a 7–7 record in 1965, before compiling a league-worst 1–12–1 record, and allowing more than 500 points on defense in 1966. During the 1969 preseason, the Giants lost their first meeting with the New York Jets, 37–14, in front of 70,874 fans at the Yale Bowl in New Haven, Connecticut. Following the game, Wellington Mara fired coach Allie Sherman, and replaced him with former Giants fullback Alex Webster. In 1967, the team acquired quarterback Fran Tarkenton from the Minnesota Vikings. Despite having several respectable seasons with Tarkenton at quarterback, including a 7–7 finish in 1967 and 9–5 in 1970, the Giants traded him back to the Vikings after a 4–10 finish in 1971. Tarkenton would go on to lead the Vikings to three Super Bowls and earn a place in the Hall of Fame, while the Giants suffered through one of the worst stretches in their history, winning only 23 games from 1973 to 1979. Before the 1976 season, the Giants tried to revive a weak offense by replacing retired RB Ron Johnson with future Hall of Fame fullback Larry Csonka, but Csonka was often injured and ineffective during his 3 years in New York. The 1977 season featured a roster that included three rookie quarterbacks. The Giants were allowed to play their home games at the Yale Bowl in New Haven, Connecticut in 1973 and 1974, and at Shea Stadium (home of the Mets and Jets) in 1975, due to the renovation of Yankee Stadium. They finally moved into their own dedicated state-of-the-art stadium in 1976, when they moved into Giants Stadium at the Meadowlands in East Rutherford, New Jersey. One of the low points during this period was the play known as the "Miracle at the Meadowlands", which occurred in 1978. With the Giants trying to kill the clock and secure a win against the Philadelphia Eagles, offensive coordinator, Bob Gibson, chose to call a running play. This resulted in "The Fumble" by QB Joe Pisarcik that was returned for a game-winning touchdown by the Eagles' Herman Edwards. The Giants' front office operations were complicated by a long-standing feud between Wellington Mara and his nephew, Tim Mara. Jack Mara had died in 1965, leaving his share of the club to his son Tim. Wellington and Tim's personal styles and their visions for the club clashed, and eventually they stopped talking to each other. Commissioner Rozelle intervened and appointed a neutral general manager, George Young, allowing the club to operate more smoothly. The feud became moot on February 20, 1991, when Tim Mara sold his shares in the club to Preston Robert Tisch. In 1983, Bill Parcells was promoted to head coach from defensive coordinator. One of his first moves was to change his starting quarterback, sitting the injury-prone and struggling Phil Simms (who had missed the entire 1982 season with an injury) and electing instead to go with Scott Brunner, who had gone 4-5 as the starter in place of Simms in the strike-shortened previous season. Parcells went as far as to demote Simms to the third string position, promoting Jeff Rutledge over Simms to be Brunner's backup. Parcells later said the move was a mistake and one he "nearly paid for dearly" as the team finished with a 3–12–1 record and his job security was called into question. In the offseason the Giants released Brunner and named Simms the starter. The move paid off as the team won nine games and returned to the playoffs. After beating the Los Angeles Rams in the Wild Card Round, the Giants prepared for a showdown against top-seeded San Francisco. The 49ers defeated the Giants 21–10 in the Divisional Round. The 1985 Giants compiled a 10–6 record and avenged their loss against San Francisco by beating them in the Wild Card round 17–3. However, they again lost in the Divisional Round, this time to the eventual Super Bowl champion Bears, by a score of 21–0. However, the following season would end with the Giants winning their first Super Bowl championship. After 9–7 and 10–6 finishes in 1984 and 1985 respectively, the Giants compiled a 14–2 record in 1986 led by league MVP and Defensive Player of the Year Lawrence Taylor and the Big Blue Wrecking Crew defense. As of 2017, this is the Giants' best regular season record since the NFL began playing 16-game seasons in 1978. After clinching the top seed in the NFC, the Giants defeated the 49ers 49–3 in the divisional round of the NFC playoffs and the Redskins 17–0 in the NFC championship game, advancing to their first Super Bowl, Super Bowl XXI, against the Denver Broncos at the Rose Bowl in Pasadena. Led by MVP Simms who completed 22 of 25 passes for a Super Bowl record 88% completion percentage, they defeated the Broncos 39–20, to win their first championship since 1956. In addition to Phil Simms and Lawrence Taylor, the team was led during this period by head coach Bill Parcells, tight end Mark Bavaro, running back Joe Morris, and Hall of Fame linebacker Harry Carson. In 1990, the Giants went 13–3 and, at the time, set an NFL record for fewest turnovers in a season (14). They defeated the San Francisco 49ers, who were attempting to win the Super Bowl for an unprecedented third straight year, 15–13 at San Francisco and then defeated the Buffalo Bills 20–19 in Super Bowl XXV. Following the 1990 season, Parcells resigned as head coach and was replaced by the team's offensive-line coach Ray Handley. Handley served as coach for two disappointing seasons (1991 and 1992), which saw the Giants fall from Super Bowl champions to an 8–8 record in 1991 and a 6–10 record in 1992. He was fired following the 1992 season, and replaced by former Denver Broncos' coach Dan Reeves. In the early 1990s, Simms and Taylor, two of the stars of the 1980s, played out the last seasons of their careers with steadily declining production. The Giants experienced a resurgent season with Reeves at the helm in 1993 however, and Simms and Taylor ended their careers as members of a playoff team. The Giants initially struggled in the post Simms/Taylor era. After starting 3–7 in 1994, the Giants won their final six games to finish 9–7 but missed the playoffs. Quarterback Dave Brown received heavy criticism throughout the season. Brown performed poorly the following two seasons, and the Giants struggled to 5–11 and 6–10 records. Reeves was fired following the 1996 season. In 1997, the Giants named Jim Fassel, who had spent the previous season as offensive coordinator of the Arizona Cardinals, as their 16th head coach. Fassel named Danny Kanell the team's starting quarterback. The Giants finished the 1997 season with a record of 10–5–1 and qualified for the playoffs for the first time in four years. However, they lost in the Wild Card round to the Vikings at home. The following year, the Giants began the season 4–8 before rallying to finish the season 8–8. One of the notable games of that season was a win over the eventual Super Bowl champion Denver Broncos in week 15, giving the Broncos their first loss of the season after starting 13–0. Before the 1999 season, the Giants signed ex-Carolina Panthers quarterback Kerry Collins. Collins was the first-ever draft choice of the expansion Carolina Panthers in 1995, and led the Panthers to the NFC Championship game in his second season. However, problems with alcohol, conflicts with his teammates and questions about his character led to his release from the Panthers. The Giants finished the season with a 7–9 record, Fassel's first losing season as head coach. After a disappointing 7–9 record in 2001, the Giants finished the 2002 season with a record of 10–6, qualifying for the playoffs as a wild card. This set up a meeting with the San Francisco 49ers in Candlestick Park in the Wild Card round. The Giants built up a sizable lead throughout the game, and led 38–14 with 4:27 left in the third quarter. However, San Francisco rallied to win the game by one point, with the final score of 39–38. In 2004, three years after their last Super Bowl appearance, Fassel was replaced by Tom Coughlin. Although Collins had several solid seasons as the Giants quarterback, he experienced his share of struggles. In 2004, the Giants completed a draft day trade for University of Mississippi quarterback Eli Manning. Manning became the team's starting quarterback in the middle of the 2004 season, taking over for Kurt Warner. During the three-year period from 2004 to 2006, Tom Coughlin's Giants compiled a 25–23 regular season record and two appearances in the Wild Card Round — both losses (to the Carolina Panthers in 2005 and to the Philadelphia Eagles in 2006.) and spawned intense media scrutiny concerning the direction of the team. During this period in their history, standout players included defensive end Michael Strahan, who set the NFL single season record in sacks in 2001, and running back Tiki Barber, who set a team record for rushing yards in a season in 2005. Barber retired at the end of the 2006 season. The Patriots (18–0) entered the Super Bowl undefeated and were 12 point favorites going into game weekend. The Giants defeated the Patriots 17–14 in Super Bowl XLII, aided by the famous "Manning to Tyree" pass. On this famous play, Manning escaped the grip of several Patriots defensive linemen, stepped up in the pocket, and heaved the ball down the middle of the field to a double covered David Tyree. With Rodney Harrison, a Patriots defensive back, all over Tyree, David managed to hold on to the ball by holding it on his helmet until he fell to the ground. This catch set up a Manning to Plaxico Burress touchdown pass in the back of the end zone to put the Giants in the lead. It was the third biggest upset by betting line in Super Bowl history (the Baltimore Colts were favored by 17 over the New York Jets in Super Bowl III, and the St. Louis Rams were favored by 14 over the New England Patriots in Super Bowl XXXVI). Co-owner John Mara described it as "the greatest victory in the history of this franchise, without question". In 2010, the Giants moved from Giants Stadium into MetLife Stadium, then known as the "New Meadowlands Stadium". They won against the Panthers in the very first game at the New Meadowlands, but then lost to the Colts in the second "Manning Bowl", so-called due to Eli Manning's brother Peyton playing for the Colts. The Giants dropped one game to the Tennessee Titans before going on a five-game winning streak, beating the Bears, Houston Texans, Lions, Cowboys, and Seattle Seahawks. Before long, the Giants were 6–2, but lost two straight to division foes: to the Cowboys 33–20 at home, and to the Eagles on the road, putting the G-Men in 2nd place in the NFC East at 6–4. In first place was the Eagles, but at December 19 they were both tied for first place at 8–4, setting up a match for first place. The Giants were at home, and led 24–3 over the Eagles at halftime. The score was 31–10 with 5:40 left in the game, but Michael Vick led the Eagles to three touchdown drives to tie the game up at 31 with 40 seconds left. After a Giants three-and-outs, Matt Dodge punted the ball to DeSean Jackson, who returned it for a touchdown, concluding the Giants' epic collapse. The next game, the Giants lost to the eventual Super Bowl Champion Green Bay Packers 45–17, and at 9–6, they faced the Redskins. They had to win and have the Packers lose in order to get into the playoffs. The Giants won 17–14, but the Packers beat the Bears 10–3, so the Giants missed out on the playoffs again, ending a collapse in which the Giants went 4–4 in their last eight games. During the 2011 preseason, the Giants lost Kevin Boss, Steve Smith, Rich Seubert, Keith Bulluck, Derek Hagan, and Pro Bowl center Shaun O'Hara to free agency. However, the season also saw the emergence of second-year wide receiver Victor Cruz and second-year tight end Jake Ballard. The Giants opened their season with a 28–14 loss to the Washington Redskins at FedEx Field on the 10th anniversary of the September 11th attacks. However, the Giants secured a 6–2 record by the midpoint of the season, including road victories over the Philadelphia Eagles and the New England Patriots. The latter victory ended the Patriots' NFL record home-game winning streak, after a touchdown pass from Manning to Jake Ballard with 15 seconds left in the game. However, the Giants then suffered a four-game losing streak, including road losses against the resurgent San Francisco 49ers and the New Orleans Saints and home losses to the Eagles and the then-undefeated Green Bay Packers, to make their record 6–6 entering December. The Giants broke their losing streak with a tightly contested 37–34 road victory over the Cowboys on December 11, but lost at home to the Washington Redskins the following week to make their record 7–7 with a Christmas Eve showdown against their crosstown rival New York Jets the following week. The Giants won, 29–14, and knocked the Eagles out of playoff contention, to set up a Week 17 home game against the Cowboys in which the winner would clinch the NFC East while the loser would be eliminated from playoff contention. The game was flexed into Sunday Night Football. The Giants defeated the Cowboys, 31–14, and clinched the NFC East title and the fourth seed in the playoffs. Wide receiver Victor Cruz finished the regular season with 1,536 receiving yards, breaking the Giants franchise record previously held by Amani Toomer. Ahmad Bradshaw scored the game-winning touchdown by falling into the end zone. The Patriots were allowing Bradshaw to get the touchdown so they would get the ball with some time remaining. When Eli Manning handed the ball to Bradshaw, he told him not to score. Bradshaw was about to fall down at the 1-yard line but his momentum carried him in, thus the "reluctant touchdown." As was the case in each of their four previous Super Bowl appearances, the Giants trailed at halftime. They are the only team in NFL history to have more than two second half, come-from-behind, Super Bowl victories (4). The Pittsburgh Steelers, who accomplished the feat in Super Bowl X and Super Bowl XIV, are the only other team to do it more than once. The Giants began the 2012 season with a home loss to the Cowboys, but rebounded to finish October with a 6–2 record and on a four-game winning streak that included a 26–3 road victory against the eventual NFC champion San Francisco 49ers. Following the arrival of Hurricane Sandy in the Northeastern United States, the Giants lost back-to-back games against the Steelers and Bengals to fall to 6–4. Despite impressive blowout home victories over the Packers, Saints and Eagles, the Giants finished the season 9–7 and out of the playoffs. The Redskins won the division with a 10–6 record, only to lose to the Seahawks 24–14 in Wild Card Weekend. QB Eli Manning, DE Jason Pierre-Paul, WR Victor Cruz, and G Chris Snee represented the Giants at the Pro Bowl. The 2013 season began with hope that the Giants could become the first team to play in the Super Bowl in their home stadium, as MetLife Stadium was scheduled to host Super Bowl XLVIII that February. However, the Giants' playoff hopes took a massive hit when they lost the first six games of the season. They rebounded to win the next four games in a row to improve to 4–6, but lost a critical home game to the Cowboys on a last-minute field goal. They finished the season 7–9 and with a losing record for the first time since 2004. The Giants drafted rookie wide receiver Odell Beckham Jr. in the 2014 NFL Draft, who would later go on to win the AP Offensive Rookie of the Year award. However, the Giants missed the playoffs for a third straight season, finishing with a 6–10 record. The 2015 season was another disappointing campaign, as the Giants showcased a struggling defense and several late-game collapses. The Giants finished the season with a 6–10 record and missed the playoffs. On January 14, 2016, the Giants announced that Ben McAdoo would become the team's head coach. He replaced Tom Coughlin, who had resigned the previous week. The Giants turned it around in 2016, ending their five-year playoff drought. The Giants later lost to the Green Bay Packers 38–13 in the Wild Card round. After having high expectations due to their 11–5 record in 2016, the Giants had an unexpected 0–5 start to the season, before pulling a massive upset versus the Broncos at Sports Authority Field at Mile High for their first win of the season. However, during the Week 5 game against the Los Angeles Chargers, Odell Beckham Jr. fractured his fibula, an injury that ended his season. During the same game, the Giants also lost wide receivers Brandon Marshall and Dwayne Harris to season-ending injuries. The season was also marred by suspensions of Dominique Rodgers-Cromartie and Janoris Jenkins. The Giants finished the 2017 season with a 3–13 record, the second worst in the league. This was also the first time since 1983 in which the Giants finished the regular season with three or less wins, and their worst record since the 16 game season was adopted in the NFL. The season was also highlighted the controversial benching of long-term quarterback Eli Manning in Week 13, and the high-profile firings of head coach Ben McAdoo and General Manager Jerry Reese, who were the first mid-season staff firings since the 1976 Giants' season. Manning was eventually renamed the starter in Week 14. Subsequently, the disastrous season led to the team being awarded the second overall pick in the 2018 NFL Draft, which they utilized to select Saquon Barkley from Penn State. Despite Barkley's selection, several questions pertained into the following season around the team's offensive line and long-term future at quarterback. The 2018 season began with Pat Shurmur being hired as the new head coach. Despite starting 1–7 for the second consecutive year, the Giants managed to marginally improve on their 3–13 campaign by finishing the season 5–11 in a 30-27 Overtime win against the Chicago Bears. After defeating the Washington Redskins in Week 14, the Giants became the first team in NFL history to win 100 regular season games against an opponent. However, this ensured last place in the NFC East for the second straight year, marking the first time they were division rock bottom in back-to-back years since 1995 and 1996. The season was also highlighted by blown 4th quarter leads which was similar to their 2015 team, where the Giants were in 12 one possession games, and lost 8 of those by 7 points or less. Following the season's end, the team were placed to select sixth overall in the 2019 NFL Draft. However, despite irregular team success, Barkley unilaterally impressed in his rookie season. He broke several NFL and Giants team record for a rookie, including having the most receptions by a running back (91), most rushing touchdowns (11), most rushing yards (1,307), and most touchdowns in a season (15). He was also selected to the 2019 Pro Bowl, alongside fellow teammates Olivier Vernon, Landon Collins, and Aldrick Rosas. The Giants have won a total of eight League Championships: 1927, 1934, 1938, 1956, 1986, 1990, 2007 and 2011. The first four of those championships came in the pre-Super Bowl era. New York's eight championships put them third among all active and defunct NFL teams, trailing only the Green Bay Packers (13) and the Chicago Bears (9). The Giants have won four Super Bowls, tied with Green Bay for the fifth most behind only Dallas, San Francisco and New England (all with 5), and Pittsburgh (6). Giants' jerseys are traditionally blue or red (or white with blue or red accents), and their pants alternate between white and gray. Currently, the Giants wear home jerseys that are solid blue with white block numbering, white pants with five thin blue/gray/red/gray/blue stripes on the pant legs, and solid blue socks. For this they gained their most renowned nickname, "Big Blue". For road uniforms, they wear a white jersey with red block numbering and red "Northwestern" stripes on the sleeves, gray pants with three thin non-contiguous red/blue/red stripes on the pant legs, and solid red socks. The Giants' current helmet is metallic blue with white block numbers, which are frontally mounted and base mounted on either side of a red stripe running down the center or frontally mounted and base mounted on the red center stripe itself. The Giants, along with the Pittsburgh Steelers, are one of only two teams in the National Football League to have the players' uniform numbers on both the front and back of the helmets. The helmet is adorned on both sides with the stylized white lower case "ny" logo and features a gray facemask. The home uniforms are generally similar to the design used from 1966 to 1974, but with some slight elements from the 1956–1961 uniforms. The road uniforms are essentially a modernization of the design used from 1956 to 1961. Additionally, the Giants had a third jersey until the 2009 season, which recalled the Giants' solid red home jerseys from the early 1950s: a solid red alternate with white block numbers. These jerseys were used a total of four times, but have since been retired. They were used once in 2004 against the Philadelphia Eagles and in three consecutive years – 2005, 2006, and 2007 – against the Dallas Cowboys. The Giants have had a long and, at times, turbulent financial history. The team was founded by Tim Mara with an investment of US$500 in 1925 and became one of the first teams in the then five-year-old NFL. To differentiate themselves from the baseball team of the same name, they took the name "New York Football Giants", which they still use as their legal corporate name. By the early 1960s, the Giants had firmly established themselves as one of the league's biggest attractions. However, rather than continuing to receive their higher share of the league television revenue, the Mara sons pushed for equal sharing of revenue for the benefit of the entire league. Revenue sharing is still practiced in the NFL today, and is credited with strengthening the league. After their struggles in the latter half of the 1960s and the entire 1970s, the Giants hired an outsider, George Young, to run the football operations for the first time in franchise history. The Giants' on-field product and business aspects improved rapidly following the move. In 1991, Tim Mara, grandson of the founder, was struggling with cancer and sold his half of the team to Bob Tisch for a reported $80 million. This marked the first time in franchise history the team had not been solely owned by the Mara family. In 2005, Wellington Mara, who had been with the team since its inception in 1925 when he worked as a ball boy, died at the age of 89. His death was followed two weeks later by the death of Tisch. In 2015, Wellington's widow and Giants co-owner Ann died due to complications from a head injury suffered in a fall. She was 85 years old. The Giants are owned and operated by John Mara and Steve Tisch. Forbes magazine estimated the value of the team in 2012 to be $1.3 billion. This ranks the New York Giants as the fourth most valuable franchise in the NFL and the ninth most valuable professional sports franchise in the world. The value has steadily increased from $288 million in 1998, to their current value. The magazine estimated their revenue in 2006 at $182 million, of which $46 million came from gate receipts. Operating income was $26.9 million, and player salary was $102 million. Current major sponsors include Gatorade, Anheuser Busch, Toyota, and Verizon Wireless. Recent former sponsors include Miller Brewing and North Fork Bank. Luxury suites, retail and game day concessions at the new stadium are provisioned and operated by global hospitality giant Delaware North. The team's average ticket price is $72. Through the lean years of the 1960s and 1970s the Giants, in spite of a 17-year-long playoff drought, still accumulated a 20-year-long waiting list for season tickets. It has been estimated that the Giants have a waiting list of 135,000 people, the largest of any North American professional sports franchise. The rivalry between the New York Giants and the Philadelphia Eagles is one of the oldest in the NFL, dating back to 1933. The two teams have frequently fought for playoff contention, NFC East titles, and respect. While the Giants have dominated this rivalry throughout most of its history, the series began to even in the 1980s, with the series lead to the Eagles 22–21 through the 1990s and 2000s. The Giants lead the series 84–82–2. The two teams have met four times in the postseason, with each team winning two games. Three of those four playoff meetings were held in the 2000s decade. New York City and Philadelphia have a strong geographic rivalry, as seen in other professional sports such as the Mets-Phillies rivalry in Major League Baseball, and the Flyers-Rangers and Devils-Flyers rivalries in the National Hockey League. The Giants have an old and storied rivalry with the Redskins, dating back to 1932. While this rivalry is typically given less significance than the rivalries with the Eagles and Cowboys, there have been periods of great competition between the two. In the 1980s the Giants and Redskins clashed as both struggled against each other for division titles and even Super Bowl Championships. Most notable among these is the 1986 NFC Championship game in which the Giants defeated the Redskins 17–0 to earn their first ever trip to the Super Bowl. Wellington Mara always felt this was the Giants oldest and truest rival, and after passing away in 2005, the Giants honored their longtime owner by defeating the Redskins 36–0 at home. The Giants lead this series 100–68–4. The Giants 100 wins against the Redskins are the most wins against another franchise in NFL history. The Giants have maintained a fierce divisional rivalry with the Dallas Cowboys since the Cowboys first began play in 1960. The two teams have a combined nine Super Bowl victories between them, and have played many games in which the NFC East title was at stake. The rivalry is unique among professional sports as it is the only divisional rivalry between sports teams from New York City and Dallas, partially due to the large distance between the two cities. The Cowboys lead the regular season series 64–45–2, while the Giants hold the lone playoff victory between the two teams, held at the conclusion of the 2007 season. Despite never being in the same division, the Giants and 49ers have developed a heated rivalry over the years. The two teams have met eight times in the playoffs (including two NFC Championship Games, both won by New York) since 1982, which is the most of any two teams in that span. The overall series is tied 16–16, as is the postseason series, 4–4. The Giants and Jets for many years had the only intracity rivalry in the NFL, made even more unusual by sharing a stadium. They have met annually in the preseason since 1969. Since 2011, this meeting has been known as the "MetLife Bowl", after the naming sponsor of the teams' stadium. Regular season matchups between the teams occur once every four years, as they follow the NFL scheduling formula for interconference games. Since the two teams play each other so infrequently in the regular season, some, including players on both teams, have questioned whether the Giants and Jets have a real rivalry. A memorable regular season game was in 1988, when the Giants faced off against the Jets in the last game of the season, needing a victory to make the playoffs. The Jets played spoiler, however, beating the Giants 27–21 and ruining the latter's playoff hopes. A different scenario unfolded during the penultimate regular season game of 2011 as the "visiting" Giants defeated the Jets 29–14. The victory simultaneously helped eliminate the Jets from playoff contention and propel the Giants to their own playoff run and eventual win in Super Bowl XLVI. The Giants lead the overall regular season series 8–5 and have won five of the past six meetings. 3 The number 14 was retired in honor of Ward Cuff in 1946. Y. A. Tittle requested 14 after the Giants traded for him in 1961, and it was retired a second time in 1964 at the conclusion of Tittle's playing career. The number is now retired in honor of both players. In the Pro Football Hall of Fame, the Giants boast the second-most enshrined members with 29. Tim Mara, Mel Hein, Pete Henry, Cal Hubbard and Jim Thorpe were a part of the original class of inductees in 1963, while Defensive End Michael Strahan, the most recent Giant inducted, was a part of the Class of 2014. Numerous members, including Larry Csonka, Ray Flaherty, Joe Guyon, Pete Henry, Arnie Herber, Cal Hubbard, Tom Landry, Don Maynard, Hugh McElhenny, and Jim Thorpe were at one time associated with the New York Giants, but they were inducted largely based on their careers with other teams. The New York Giants unveiled their own Ring of Honor on October 3, 2010 during halftime of their Sunday Night Football matchup with the Chicago Bears. John Mara had long wished to create a Giants Ring of Honor and Hall of Fame to honor Giants who helped the franchise achieve each of their championships, and the building of MetLife Stadium resulted in the realization of that ambition. The organization had an inaugural induction class of 30 including players, coaches, owners and executives that have had a great impact on the organization. While the entire list of inductees was not revealed until the actual induction, the organization did confirm about a week before the ceremony that Phil Simms, Bill Parcells, Michael Strahan, Tiki Barber, Frank Gifford and Pete Gogolak would all be inducted. As of 2010, the Giants' flagship radio station is WFAN, with games simulcast on WFAN-FM as of November 2012. Beginning in 2012, the Giants became WFAN's top priority during the entire football season; prior to that, games that conflicted with late season New York Mets baseball games in September and early October were moved to other CBS Radio owned stations. This arrangement only lasted for 2012, and the Mets received priority again in 2013. WFAN acquired the rights to New York Yankees games for 2014, and thus the Giants' schedule will be in conflict with them for the foreseeable future. When there is an overlap, Giants games are carried by WFAN's sister station, WCBS-AM. Preseason telecasts not seen nationally air in the area on WNBC, with WWOR-TV serving as an overflow station for when WNBC is airing other programming such as the Summer Olympic Games. Papa and Banks call these games on television, with studio host Paul Dottino as Papa's substitute. WPIX-TV or WABC-TV will also air any Giants broadcast that is carried by ESPN, as per the local carriage rules (WABC-TV corporate parent, The Walt Disney Company, holds an 80% majority ownership stake in ESPN, and has a right of first refusal for these telecasts). Thursday Night Football games exclusive to NFL Network are carried locally by the producing network's O&O, either WCBS-TV, WNBC or WNYW (as is the case for 2018). ^ "New York Giants Team Facts". Pro Football Hall of Fame. Retrieved October 2, 2017. ^ "New York Giants Team Capsule" (PDF). 2018 Official National Football League Record and Fact Book. NFL Enterprises, LLC. August 9, 2018. Retrieved September 11, 2018. ^ a b c Salomone, Dan (June 27, 2013). "Watch: Giants uniform breakdown & history". New York Giants. Archived from the original on July 1, 2013. Retrieved September 11, 2018. ^ "New York Giants 2013 Logo Slick" (PDF). New York Giants. July 15, 2013. Retrieved July 7, 2015. ^ Eisen, Michael (January 4, 2013). "2013 Training Camp to be held in NJ". New York Giants. Retrieved December 12, 2016. ^ "Albany No More: Giants To Hold 2013 Training Camp At The Meadowlands". CBS News. January 4, 2013. Retrieved January 4, 2013. ^ Jimmy the Geek (February 1, 2008). "Wilmington Blogs:Pulp Culture | The News Journal". delawareonline. Archived from the original on September 10, 2010. Retrieved November 8, 2010. ^ a b c d e f g h i j k l m n o New York Giants (1925 – ) Archived April 9, 2007, at the Wayback Machine, databasefootball.com. Retrieved January 23, 2007. ^ a b c d e f "Championship games 1925–1949". Archived from the original on July 1, 2006. Retrieved January 12, 2007. , giants.com. Retrieved January 12, 2007. ^ Thomas, Robert McG., Jr. "Two Giants Were Heroes Far From Playing Field", The New York Times, January 26, 1991. Retrieved September 25, 2009. ^ a b c History of the New York Giants, sportsecyclopedia. Retrieved September 12, 2006. ^ Kart, Larry. "The Chicago Bears wins the 1963 NFL Championship". Chicago Tribune. Retrieved October 14, 2010. ^ a b 1966 NFL Standings, Stats and Awards Archived April 8, 2007, at the Wayback Machine, databasefootball.com. Retrieved March 17, 2007. ^ a b Fran Tarkenton Archived January 16, 2009, at the Wayback Machine, vikingupdate.com. Retrieved March 18, 2007. ^ Vecsey, George (February 21, 1991). "Sports Of The Times; The Feud That Won Super Bowls". The New York Times. Retrieved October 8, 2010. ^ Lawrence Taylor Archived May 1, 2006, at the Wayback Machine, databasefootball.com. Retrieved February 20, 2007. ^ "HolidayCalendar". Giants.com. April 28, 2004. Archived from the original on January 1, 2011. Retrieved October 8, 2010. ^ Battista, Judy. "Redskins - The Fifth Down Blog". Fifthdown.blogs.nytimes.com. Retrieved October 8, 2010. ^ a b "Championship Games 1950–present". Archived from the original on March 17, 2007. Retrieved December 1, 2010. CS1 maint: BOT: original-url status unknown (link), giants.com. Retrieved January 12, 2007. ^ Joe Morris Archived December 27, 2007, at the Wayback Machine, databasefootball.com. Retrieved May 3, 2007. ^ Fucillo, David (July 3, 2009). "49ers' Year-by-Year: 1990". Niners Nation. Retrieved November 8, 2010. ^ 1994 New York Giants Archived April 8, 2007, at the Wayback Machine, databasefootball.com. Retrieved March 20, 2007. ^ King, Peter. Renewed and revitalized at 28, Collins finally comes clean, Sports Illustrated, January 22, 2001. Retrieved March 21, 2007. ^ Rhoden, William C. Sports of The Times; With Season at Crossroads, Fassel Dares His Team, The New York Times, November 27, 2000. Retrieved May 12, 2007. ^ a b c "Super Bowl XXXV recap". Archived from the original on July 12, 2007. Retrieved May 25, 2007. CS1 maint: BOT: original-url status unknown (link), National Football League. Retrieved May 12, 2007. ^ Magee, Jerry. Nothing personal, San Diego; Eli Manning just didn't want to be a Charger Archived October 3, 2005, at the Wayback Machine, U-T San Diego, September 21, 2005. Retrieved March 21, 2007. ^ Tom Coughlin coaching profile, ESPN. Retrieved March 22, 2007. ^ Associated Press. Strahan breaks Gastineau's 17-year-old record, ESPN, January 2001. Retrieved March 11, 2009. ^ "Tiki Barber plans to stay busy after retirement". Archived from the original on April 3, 2007. Retrieved April 23, 2007. , National Football League, February 6, 2007. Retrieved March 22, 2007. ^ PAUL NEWBERRY (November 4, 2010). "Giants win their fourth in a row, routing hapless Falcons 31–10". Yahoo!. Retrieved November 8, 2010. ^ O'Halloran, Ryan (February 3, 2008). "Superbowl [sic] XLII preview". The Daily Telegraph. London. Retrieved November 8, 2010. 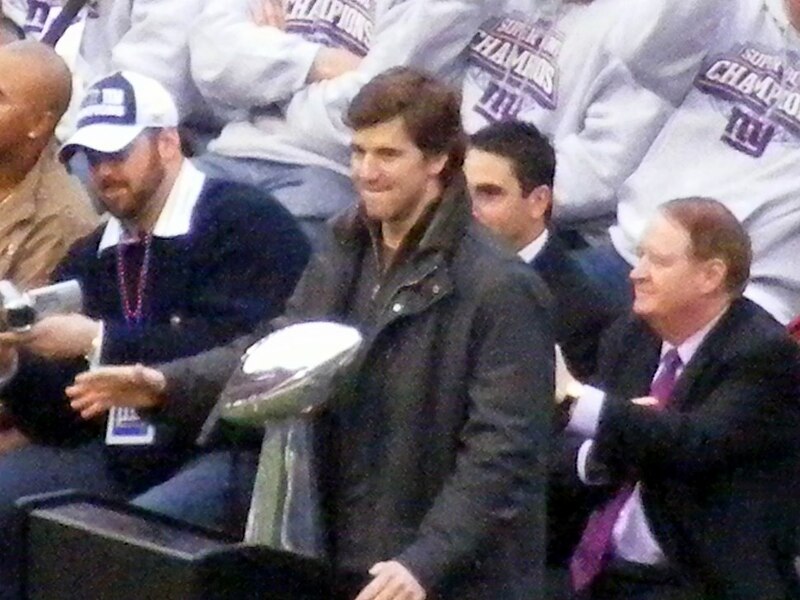 ^ "Giants End Pats Perfect Season; Win Super Bowl". Archived from the original on October 11, 2016. Retrieved August 15, 2016. ^ Vacchiano, Ralph. Improbable Super Bowl victory capped incredible Giant season, Daily News|location=New York, February 10, 2008. Retrieved November 24, 2008. ^ "schedule_2009". Giants.com. September 30, 2009. Archived from the original on December 31, 2010. Retrieved November 8, 2010. ^ NFL Stats: by Team Category. National Football League. Retrieved January 31, 2012. ^ "New York Giants Lose Season Opener Against Washington Redskins 28-14: Rapid Reaction". Archived from the original on October 11, 2016. Retrieved August 21, 2016. ^ "NFL Game Center: New York Giants at New England Patriots – 2011 Super Bowl". National Football League. Retrieved September 3, 2012. ^ "Odds and Interest: a Look at the 2013 NFL Pro Bowl". Archived from the original on October 11, 2016. Retrieved August 11, 2016. ^ "NFL Experience Will not Be a Part of Super Bowl XLVIII in New York/New Jersey". Archived from the original on October 11, 2016. Retrieved August 12, 2016. ^ "New York Giants Fail to Live up to Talk and Guarantees, Fall 24-21 to Dallas Cowboys". ^ "Odell Beckham Jr. "Happy" to Land with New York Giants; Recalls Past with Eli Manning". Archived from the original on October 11, 2016. Retrieved August 9, 2016. ^ Eisen, Michael (January 14, 2016). "Ben McAdoo named New York Giants head coach". Giants.com. Archived from the original on September 12, 2017. Retrieved January 14, 2016. ^ "Giants injury updates: Odell Beckham Jr. to have season-ending ankle surgery". Sporting News. October 9, 2017. Retrieved November 27, 2017. ^ "Rodgers-Cromartie suspended after blowup with McAdoo". New York Post. October 11, 2017. Retrieved November 27, 2017. ^ "Giants suspend Janoris Jenkins indefinitely". New York Post. October 31, 2017. Retrieved November 27, 2017. ^ Fennelly, John (December 9, 2018). "Giants defeat Redskins, 40-16: Instant analysis". Giants Wire. Retrieved December 9, 2018. ^ "History of the New York Giants". Archived from the original on September 27, 2010. Retrieved October 20, 2010. CS1 maint: BOT: original-url status unknown (link), giants.com. Retrieved January 12, 2007. ^ NFL History: 1921–1930, National Football League/history. Retrieved May 13, 2007. ^ a b Burke, Monte. Turning $500 Into A $573 Million NFL Team, Forbes, August 29, 2003. Retrieved June 1, 2007. ^ Tim Mara died in 1959. Attendance Rises in Pro Football; Grand Total for League Games and Extra Contests in 1939 Placed at 1,575,289 Increase 12.3 Per Cent Giants First For Home Crowds With 233,440 During Season --Detroit Places Next, The New York Times, December 17, 1939. Retrieved June 4, 2007. * Pro Football set Attendance Mark; National League Teams Played to More Than 1,600,000 Fans During 1940 Dodgers Drew 146,229 Washington, Pittsburgh Also Attracted Larger Crowds to Home Games, The New York Times, December 24, 1940. Retrieved June 4, 2007. ^ a b Teams valuation:1998-2005-New York Giants, Forbes. Retrieved June 4, 2007. ^ a b c d e New York Giants (2006), Forbes. Retrieved June 4, 2007. ^ "Giants co-owner Ann Mara dies at age 85". February 2015. ^ a b c d New York Giants (2004), Forbes. Retrieved June 4, 2007. ^ Kurt Badenhausen (April 18, 2012). "Manchester United Tops The World's 50 Most Valuable Sports Teams". Forbes. Retrieved September 3, 2012. ^ a b Associated Press. Two states claim NFC champion Giants as their own, Sports Illustrated, January 19, 2001. Retrieved June 4, 2007. ^ Matuszewski, Erik. New York's Giants Victory Parade Set for Tomorrow, Bloomberg L.P., February 4, 2008. Retrieved February 4, 2008. ^ "New York Giants Head-to-Head Records - Pro-Football-Reference.com". Pro-Football-Reference.com. ^ Sphigel, Ben (December 20, 2011). "The Jets' Players Are Asking Themselves: Is This a Rivalry Game?". The New York Times. Retrieved September 17, 2012. ^ Samuel, Ebenezer (August 14, 2012). "Giants' Weatherford: Beating Jets is 'sweet'". Daily News. New York. Retrieved September 17, 2012. ^ B, John (December 23, 2011). "Jets vs. Giants: How Big of a Rivalry Is It?". SB Nation. Retrieved September 17, 2012. ^ DelVecchio, Steve (November 8, 2011). "Bart Scott: Jets-Giants Not a Rivalry Because You Don't Have to Fight Over Strippers in New York". Larry Brown Sports. Retrieved September 17, 2012. ^ Brandt, Gil. "Scouts reveal their sleepers". Archived from the original on May 29, 2006. Retrieved June 4, 2007. CS1 maint: BOT: original-url status unknown (link), National Football League, August 30, 2005. Retrieved June 4, 2007. ^ "New York Giants Retired Jersey Numbers". Big Blue Interactive. Retrieved August 25, 2016. ^ "Headlines – Story – Giants to Unveil Ring of Honor". Giants.com. September 29, 2010. Archived from the original on November 15, 2010. Retrieved November 8, 2010. ^ "Giants New Ring Of Honor: Who Deserves A Spot?". Bleacher Report. September 30, 2010. Archived from the original on October 5, 2010. Retrieved November 8, 2010. ^ a b "Giants.com - TV & Radio Gameday Guide". Carroll, John Martin (1999). Grange and the Rise of Modern Football. Urbana: University of Illinois Press. ISBN 978-0-252-07166-9. Neft, David S.; Cohen, Richard M.; Korch, Rick (1994). The Complete History of Professional Football from 1892 to the Present. New York: St. Martin's Press. p. 113. ISBN 978-0-312-11435-0. Steinbreder, John (1999). Giants: 75 Years of Championship Football (second ed.). Dallas: Taylor Publishing Co. ISBN 978-0-87833-159-8. Whittingham, Richard (2005). Illustrated History of the New York Giants. Chicago: Triumph Books. ISBN 978-1-57243-641-1. The 1954 New York Giants season was the franchise's 72nd season. The Giants won the National League pennant with a record of 97 wins and 57 losses and then defeated the Cleveland Indians in the World Series. The 1954 World Series matched the National League champion New York Giants against the American League champion Cleveland Indians. The Giants swept the Series in four games to win their first championship since 1933, defeating the heavily favored Indians, who had won an AL-record 111 games in the regular season; it has since been broken by the 1998 New York Yankees (114) and again by the 2001 Seattle Mariners (116, tying the 1906 Chicago Cubs for the most wins ever). The Series is perhaps best-remembered for "The Catch", a sensational running catch made by Giants center fielder Willie Mays in Game 1, snaring a long drive by Vic Wertz near the outfield wall with his back to the infield. It is also remembered for utility player Dusty Rhodes' clutch hitting in three of the four games, including his walk-off hit for Monte Irvin that won Game 1, probably the best-known hit to be described as a "Chinese home run", since it barely cleared the 258-foot (79 m) right-field fence at the Polo Grounds. Giants manager Leo Durocher, who had managed teams to three National League championships, won his first and only World Series title in his managerial career. The Giants, who would move west to become the San Francisco Giants, would not win a World Series again until the 2010 season. This was the first time the Cleveland Indians had been swept in a World Series and the first time the New York Giants had swept an opponent without qualification. They had won four games without a loss in the 1922 World Series, but there was also one tie. Game 2 was the last World Series and playoff game at the Polo Grounds, because the Giants did not win another pennant until after their move to San Francisco and because the Mets did not reach the postseason until after they moved to Shea Stadium. Game 4 was the last World Series and playoff game at Cleveland Stadium; the Indians did not return to the World Series or playoffs until 1995, a year after Jacobs Field opened. On December 29, 2007, during the final week of the 2007 season, the New England Patriots defeated the New York Giants, 38–35, at Giants Stadium in East Rutherford, New Jersey. In what became a preview of Super Bowl XLII, the game was a close comeback win for the Patriots, giving them the first undefeated regular season since the 1972 Miami Dolphins and the only undefeated regular season since the league expanded to 16 games. The game, notable for the events related to its television broadcast, was the second of three meetings between the teams in the 2007 season: they met in the last week of the preseason, and again in Super Bowl XLII, in which the Giants upset the Patriots 17–14. The 2019 New York Giants season will be franchise's 95th season in the National Football League, their tenth playing their home games at MetLife Stadium in East Rutherford, New Jersey and their second under head coach Pat Shurmur. They will attempt to improve on their 5–11 campaign from last year. Carl E. Banks (born August 29, 1962) is a former American football linebacker in the National Football League. He played from 1984 to 1995 for the New York Giants, the Washington Redskins and the Cleveland Browns. David Alan Gettleman (born February 21, 1951) is an American football executive who is the general manager for the New York Giants of the National Football League (NFL). He was previously the general manager of the Carolina Panthers. (born January 3, 1981) is an American football quarterback for the New York Giants of the National Football League (NFL). He played college football at the University of Mississippi from 2000 to 2003. He was drafted as the first overall pick in the 2004 NFL Draft by the San Diego Chargers and was immediately traded to the Giants who in return gave up a package, highlighted by fourth overall selection Philip Rivers. Manning is the son of former NFL quarterback Archie Manning and the younger brother of former NFL quarterback Peyton Manning. Manning holds Giants franchise records for most passing yards, touchdown passes, and completed passes in a career. In 2012, in a 41–34 win over the Tampa Bay Buccaneers, he threw for 510 yards, 3 yards short of Phil Simms' record of 513. He led the Giants to victory in Super Bowls XLII and XLVI, defeating the New England Patriots in both games. Manning was named Most Valuable Player in both Super Bowls, becoming one of five players to have multiple Super Bowl MVP awards (Bart Starr and Terry Bradshaw also have two, Joe Montana three and Tom Brady four). Manning started 210 straight games from 2004 to 2017, the second-longest consecutive starts streak by a quarterback in NFL history. He is the seventh all-time leader in passing yards and eighth in touchdowns. Though lacking his brother's regular-season consistency and high-caliber performances, Manning is known for his two improbable Super Bowl-winning postseason runs in 2007 and 2011, in which he led an underdog Giants squad to Super Bowl victories twice against the Patriots. Jesse Cail Burkett (December 4, 1868 – May 27, 1953), nicknamed "Crab", was an American left fielder in Major League Baseball from 1890 to 1905. He batted over .400 twice. After his playing career, Burkett managed in the minor leagues. He was elected into the Baseball Hall of Fame in 1946. John K. Mara, Esq ( MAR-ə (born December 1, 1954) is the president, CEO, and co-owner of the New York Giants. The New York Giants are an American football team based in East Rutherford, New Jersey. They are a member of the National Football League (NFL) and play in the NFL's National Football Conference (NFC) East division. In 94 completed seasons, the franchise has won eight NFL championships, including four Super Bowl victories. The Giants have won more than 600 games and appeared in the NFL playoffs 32 times. Though the Giants play home games in East Rutherford, they draw fans from throughout the New York metropolitan area. In 2010, the team began playing in MetLife Stadium, formerly New Meadowlands Stadium.After Tim Mara paid $500 for the franchise, the Giants joined the NFL in the 1925 season and won their first championship two years later. In 1934, the team won its second title, defeating the Chicago Bears in the NFL Championship Game. The Giants won another championship four years later, and made four appearances in the NFL Championship Game from 1939 to 1946, losing each time. New York won its fourth NFL title in 1956, with a 47–7 win over the Bears in the championship game. From 1958 to 1963, the Giants reached the NFL Championship Game five times, but were defeated on each occasion. Following the 1963 season, the franchise did not return to the playoffs until 1981, only finishing .500 or better five times during the postseason drought. Thirty years after the team's previous NFL title, the Giants were victorious in Super Bowl XXI, winning against the Denver Broncos 39–20 to end the 1986 season. The Giants won their second Super Bowl four years later, defeating the Buffalo Bills 20–19 in Super Bowl XXV. In the 2000 season, New York returned to the Super Bowl, but lost to the Baltimore Ravens 34–7. The 2007 season saw the Giants win their seventh NFL championship at Super Bowl XLII, where they defeated the previously unbeaten New England Patriots 17–14 in a game that is widely considered to be one of the biggest upsets in Super Bowl history. The Giants made four consecutive appearances in the playoffs from 2005 to 2008, before an 8–8 record in 2009 caused them to miss the postseason. After missing the playoffs in 2010, they defeated the Atlanta Falcons, Green Bay Packers, and San Francisco 49ers in the 2011 playoffs to reach Super Bowl XLVI, where they defeated the Patriots 21–17. In the most recent season, 2018, the Giants went 5–11 and did not qualify for the postseason. Michael Francis Mayock (born August 14, 1958) is an American football executive and former player who is the current general manager of the Oakland Raiders of the National Football League (NFL). Mayock was also a safety with the New York Giants of the NFL, a draft analyst for the NFL Network and a game analyst for NBC's coverage of Notre Dame football. Mayock is known for his thick Philadelphia accent/lisp. The National Football Conference – Eastern Division or NFC East is one of the four divisions of the National Football Conference (NFC) in the National Football League (NFL). It currently has four members: the Dallas Cowboys, the New York Giants, the Philadelphia Eagles, and the Washington Redskins. The division was formed in 1967 as the National Football League Capitol Division, keeping with the theme of having all of the league's divisions starting with the letter "C." The division was so named because it was centered on the capital of the United States, Washington, D.C. In 1967 and 1969 the teams in the NFL Capitol Division were Dallas, Philadelphia, Washington and the expansion team New Orleans Saints, which had been replaced by the New York Giants for the 1968 season. As of 2018, the NFC East is the only division in the league in which all four current teams have at least one Super Bowl win. Odell Cornelious Beckham Jr. (born November 5, 1992) is an American football wide receiver for the Cleveland Browns of the National Football League (NFL). Born in Baton Rouge, Louisiana, Beckham played college football at nearby Louisiana State University (LSU), and was drafted by the New York Giants in the first round of the 2014 NFL Draft with the 12th overall pick. Since entering the NFL, Beckham has been one of the most productive and popular players, but he has drawn media scrutiny for his conduct on and off the playing field. Beckham started the 2012 BCS National Championship Game in his first year playing for the LSU Tigers, and won the Paul Hornung Award following his junior season in 2013. In his first season with the New York Giants, Beckham broke numerous NFL rookie receiving records, despite missing the first four games of the season due to injury. Beckham became the first player to record more than 75 receptions, 1,100 yards, and ten touchdowns in a rookie season, and broke the rookie record for the most average receiving yards per game. During Week 12 of his first season, Beckham came to national attention when he made a one-handed touchdown catch whilst falling backwards in a Sunday Night Football game against the Dallas Cowboys, which numerous pundits and athletes called the greatest catch ever made. Beckham went on to win the 2014 Offensive Rookie of the Year award. Beckham continued his remarkable form beyond his rookie season. In 2016, he became the fastest player in NFL history to reach both 200 career receptions and 4,000 career receiving yards. In 2016, he recorded his first 100-reception season and reached the NFL playoffs for the first time in his career, after helping the Giants to an 11–5 season record. Beckham was named to the Pro Bowl in each of his first three seasons in the NFL, and has been named a second-team All-Pro twice. Spencer Paysinger (born June 28, 1988) is a retired American football linebacker. He was signed by the New York Giants as an undrafted free agent in 2011. Wellington Timothy Mara (August 14, 1916 – October 25, 2005) was the co-owner of the New York Giants of the National Football League (NFL) from 1959 until his death, and one of the most influential and iconic figures in the history of the NFL. He was the younger son of Tim Mara, who founded the Giants in 1925. Wellington was a ball boy for that year.